The contemporary look of this Safavieh Courtyard area rug adds style to any room. Complete your home's contemporary design with this indoor/outdoor rug made of plush synthetic material. Its machine-made construction is sure to endure the constant treading of feet and furniture. Include this border patterned red rug in your living spaces for a high quality and high fashion look. This Safavieh Courtyard area rug adds a touch of modern flair to the design of any area in your home. Decorate the right way with this indoor/outdoor piece constructed from plush synthetic material. This machine-made rug will make a bold statement in your home that lasts. Quality is assured with this geometric patterned grey rug. This Safavieh Courtyard area rug adds a touch of modern flair to the design of any area in your home. Designed for your hallway, dining room, or living room, this indoor/outdoor piece made from plush synthetic material looks and feels great. Contemporary comfort comes in the form of this machine-made rug. Quality is assured with this geometric patterned red rug. This Safavieh Courtyard area rug is sure to make a statement in any room of your modern home. Constructed to be an indoor/outdoor piece, this plush synthetic material rug is sure to make a statement in your home. This rug is machine-made, which ensures a strong product. This grey rug with its geometric pattern is modern and stylish. This Safavieh Courtyard area rug infuses contemporary style into any room in your home. Add this indoor/outdoor rug to your home for a comfy, yet stylish design option since it is made from plush synthetic material. This machine-made rug makes long-term decorating easy. Bring this floral plants patterned grey rug into your living spaces for a contemporary design aesthetic. Courtyard Elena Red / Natural 5 ft. 3 inch x 5 ft. 3 inch Indoor/Outdoor Round Area Rug The contemporary look of this Safavieh Courtyard area rug adds style to any room. Complete your home's contemporary design with this indoor/outdoor rug made of plush synthetic material. Its machine-made construction is sure to endure the constant treading of feet and furniture. Include this border patterned red rug in your living spaces for a high quality and high fashion look. 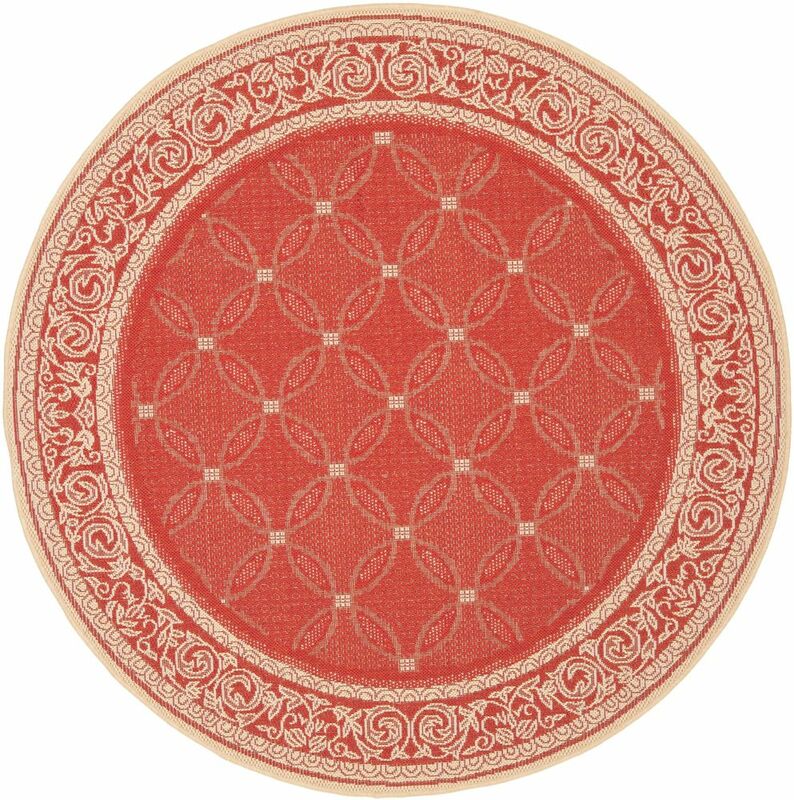 Courtyard Elena Red / Natural 5 ft. 3 inch x 5 ft. 3 inch Indoor/Outdoor Round Area Rug is rated 3.3 out of 5 by 3. Rated 1 out of 5 by carpet from EXTREMELY disappointed in the “outdoor” rug. Color faded within a month. When it rained, powder a... EXTREMELY disappointed in the “outdoor” rug. Color faded within a month. When it rained, powder actually came off the carpet (the color!). I now have to replace it this year. Would NOT recommend. Rated 4 out of 5 by Dharam from The size was 6.4 ft x 6.4 ft instead of... The size was 6.4 ft x 6.4 ft instead of 7 ft x 7 Ft. (It was not the right size as ordered). Therefore the carpet was returned. Rated 5 out of 5 by Ruby from Stylish I absolutely love this rug. It compliments my outdoor patio furniture. Perfect for outdoor area.